The Office of Arts & Culture (ARTS), in partnership with Seattle Parks and Recreation, has selected Seattle artist Elizabeth Gahan to create a permanent, site-specific artwork for a new park in Seattle’s Lake City Neighborhood. The new neighborhood park located at 12510 33rd Ave NE, previously housed an office building that was purchased in 2010 as part of the Green Spaces Levy, and demolished early 2016. The park will serve Lake City’s growing population with much needed green space and provide a safe place to play, exercise and enjoy. Seattle Parks and Recreation has worked over the past year to gather community input into the overall design of this ¼ acre park. Gahan is a Seattle-based artist. She received a dual undergraduate degree in Global Studies and Fine Art from the University of California, Santa Barbara, and a Master’s degree in Fine Art from Claremont Graduate University in Claremont, CA with an emphasis in painting. Her current artwork considers relationships between natural and built environments as well as local community and global connectivity. Having completed numerous temporary commissions including Seattle Center’s Poetry Art Garden Series in 2016, Gahan has also recently been awarded commissions for new permanent artwork for the City of Spokane as well as a Washington State Arts Commission project at Washington Elementary School in Wenatchee, WA. The artwork is being funded through Seattle Parks and Recreation. Description: Colorful corrugated plastic is manipulated to take on an organic form existing symbiotically with the host tree. Yet, the use of synthetic materials and ads points to a broader conversation of the impact of urban growth and consumer culture on the natural environment. Seattle Parks and Recreation (SPR) is now accepting applications for three Seattle Park District-funded programs for community activities in 2017. – This program funds outdoor arts and cultural events in parks throughout the city. – Funded projects include new and established festivals, events, and temporary public art that bring life to Seattle’s parks, especially in underserved areas of the city. – Individual artists, neighborhood arts councils, and local community-based groups are eligible to apply. – Applications are available online at www.seattle.gov/arts/arts-in-parks, in multiple languages. Applications are due by October 19, 2016 at 11 p.m.
– For more information, please call Jenny Crooks at 206-684-7084 or email her at jenny.crooks@seattle.gov. – These programs fund culturally relevant physical and enrichment programming to under resourced communities and in neighborhoods where health and enrichment disparities are prevalent. – The goal of the community funding is to further strengthen the collaborative working relationship between SPR and Seattle communities through innovative and sustainable programs. – Nonprofit organizations, small businesses, and community groups are eligible to apply. – Applications are available online at http://www.seattle.gov/parks/about-us/special-initiatives-and-programs/get-moving in multiple languages. Applications are due by October 24, 2016 at 5 p.m. Learn what makes a strong application by attending a workshop. This interactive question-and-answer session will cover specifics on eligibility and how to apply. We can make interpreters available with 72 hours advance notice. First time applicants are encouraged to attend. October 1, 2016, 5-6:30 p.m.
Van Asselt Community Center, 2820 S Myrtle St.
October 4, 2016, 5:30-7 p.m.
October 11, 2016, 6:30-8 p.m.
Southwest Teen Life Center, 2801 SW Thistle St. The new Seattle Park District is enlivening the region with more art, more events and more fun with the Put the Arts in Parks program. The Put the Arts in Parks program is a partnership between the Office of Arts & Culture and Seattle Parks and Recreation, celebrating diversity, building community connections, and energizing parks while connecting with underserved communities. A feature of the program is temporary art installations in public parks throughout the city. 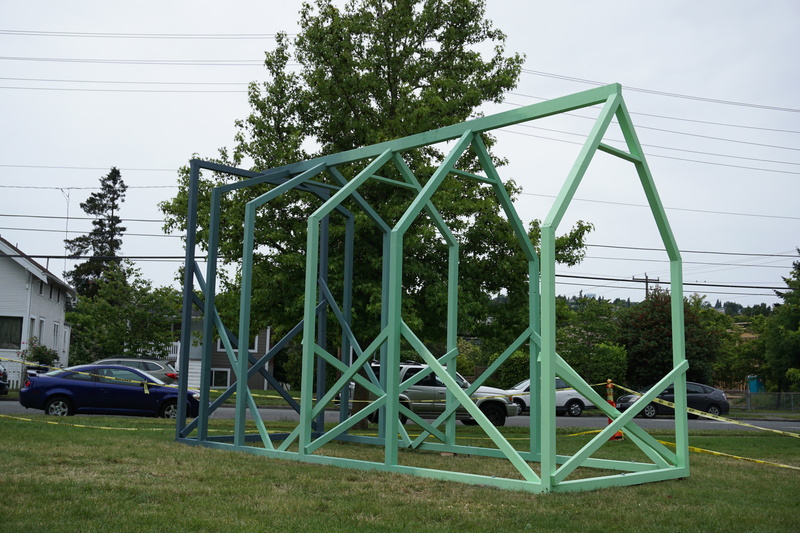 Beginning in June, seven temporary artworks will be installed in four parks, Ballard Commons Park, Cal Anderson Park, Delridge Playfield, Duwamish Waterway Park and Lake City Mini Park. The first artwork installed is Water-qwuʔ by artist Melissa Koch at Lake City Mini Park. ‘qwuʔ – ‘WATER’ is a temporary art installation that celebrates the sacredness of water. The project is inspired by the wetlands, marshes and streams found in the Lake City area and honors the Duwamish tribe known as hah-chu-ahbsh (Lake People) who were the original inhabitants of the land with their settlements along Lake Washington. The artwork consists of imagery that has been cut out of Tyvek and is inspired by local mythologies and the nature of water in its varying forms: raining, coursing, flowing, rippling, rolling, splashing, shimmering, as the element that supports life and connects us to one another and to our environment. The artwork will hang from the back side of an existing concrete archway in the Lake City Mini Park through August 8, 2016. Funding is made possible through the Seattle Parks District. For more information about Put the Arts in Parks programs and art installations check out the Put the Arts in Parks brochure. Melissa Koch combines drawing, painting, collage, printmaking and more recently, mixed media and cut Tyvek installations to create multi layered visual narratives that explore myths and stories. She participated in the Office of Arts & Culture’s 2016 Public Art Boot Camp. Her art practice and creative life are ongoing commitments to innovating and exploring new ideas not only technically and aesthetically, but also on a human and ecological level. Installation images by Jenny Crooks. A new temporary art installation, PARK YOUR THOUGHTS by artist Blanca Santander has transformed a slice of Ballard Commons into a public poetry corner as people Park their Thoughts, free of charge. Santander’s artwork consists of a large black monolith with word tiles attached with Velcro on the surface. This interactive installation encourages visitors to engage and express themselves with street poetry. The words on the tiles spring from the local community’s input and fosters expression, inclusion, acceptance, family, nature and life. The artwork empowers people to compose poems and thoughts to share with the community. Funding is made possible through the Seattle Parks District. Blanca Santander majored in fine arts and studied painting, drawing, sculpture, engraving, photography, and art history. She was influenced by great post-impressionist and modern masters, Chagall, Modigliani, and Klimt. Santander’s paintings are intimate, spiritual and feminine and connected with Pachamama, or Mother Nature. She has exhibited her work at the Seattle Municipal Tower Ethnic Heritage Gallery, City of Kent Centennial Center Gallery and the Sacred Circle Gallery in the Daybreak Star Cultural Center. For the temporary art installation My Home, artist Elise Koncsek provides a voice for Seattleites experiencing homelessness and a space/forum/outlet to publicly share their needs and ideas for housing solutions. The installation will consist of approximately 15 painted laser cut wood panels suspended from the arch at Lake City Mini Park. The central panel will represent the concept of “Home” and will be surrounded by other brightly painted panels that contain definitions of the concept of home offered by homeless and refugee Seattleites that Koncsek worked with to create the installation. Koncsek’s aim is to spark discussion about homelessness in our city and encourage inclusion of people receiving housing services in the designing of service programs. My Home was created in collaboration with Consuela Thomas, Sylvester Young Jr., Crissy, Haregu Kahsory, JR, Olivia & Hailey, Lwam Tesfay, Mya “Baby Girl” Haggard, Daniel “Bad Boy” Haggard, Tsedale Woldesemaya, Robert M. Stevens, Ayan Ali, Dahlak Andemariam, Karlie Taylor, Willie III, and the staff at Mary’s Place Family Center. Special thanks to Artech for their Public Art Grant which provided installation support and Zot Lasers for laser cutting services. Funding is made possible through the Seattle Park District. Lap and Family Swims 5-7 p.m.
– The Othello Quartz Festival, new date: Sunday, July 17, 1-7 p.m.
– The African Village Experience, new date: Monday, July 25 through Friday July 29, daily from 5 to 8 p.m.
– The Delridge Community Center Park’s “Day of Dance 2016,”new date: Sunday, August 14 from noon to 6:30 p.m.
– There will not be a performance of Blood Wedding in Duwamish Waterway Park on Sunday, August 28. – Unfurled, a public art installation in Lake City Mini Park, will be on display October through November. The Put the Arts in Parks 2016 brochure is now available and includes an exciting summer of events funded by the program in its pilot year. Made possible by the Seattle Park District, the Put the Arts in Parks program is a partnership between the Office of Arts & Culture and Seattle Parks and Recreation seeking to enliven Seattle parks by promoting arts and culture, celebrating diversity, building community connections, and energizing parks while connecting with underserved communities. “Seattle has wonderful and distinctive art throughout our parks, and this exciting initiative will build on that,” said Jesús Aguirre, Superintendent of Seattle Parks and Recreation. Put the Arts in Parks is funding 39 events, series, and art installations through September 2016, providing $199,400 in support to community-based organizations and artists. The brochure is a comprehensive guide to all funded projects, including community festivals, dance and art workshops, music concerts, and more. Copies of the brochure will be available at all community centers, Teen Life Centers, Neighborhood Service Centers, and public libraries within two weeks. All events are free and open to the public. This spring the historic Lincoln Reservoir Gate House at Cal Anderson Park will host Seasons All Around, 14 original temporary artworks created by nine Washington Middle School students. The artworks will grace the windows of the gate house through December 2016 and feature images inspired by the four seasons. On Sunday, May 22 from 11 a.m. to noon the students, teaching artist and City departments will host an opening celebration of the temporary artworks. The gate house project is a collaboration between the Seattle Office of Arts & Culture, Seattle Parks and Recreation’s Out of School Time program at Washington Middle School, Seattle Public Utilities and Seattle Department of Neighborhoods Historic Preservation Program. Students worked with teaching artist Nate Herth over 15 weeks to design and create 14 original paintings reflecting on the park and the vibrancy of the Seattle. 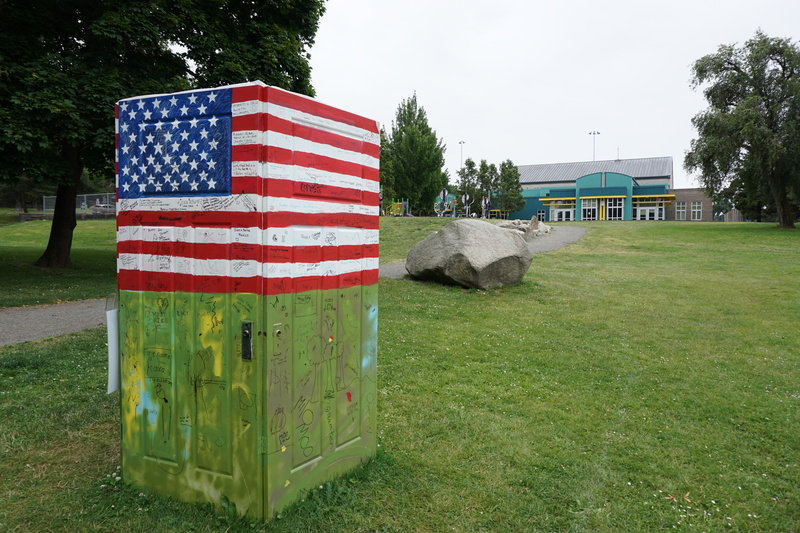 The classes took place at Washington Middle School and the students, representing the many races and ethnicities of Seattle, drew upon their varied prior experience with art, color, and Seattle’s neighborhoods to create this public art installation. The artworks created by the students were photographed and are installed in the gate house windows. The Lincoln Reservoir in Cal Anderson Park was built after the Great Seattle Fire of 1889 and put to use in 1901. In 2000 the reservoir was taken out of service and replaced by underground tanks, but the gate house remains. The park reopened in 2005 with four additional acres of useable open space. SEATTLE, (February 22, 2016) —The Seattle Office of Arts & Culture in conjunction with Seattle Parks and Recreation today announced $198,400 in funding awards and artist selections for the Put the Arts in Parks pilot program. One of the first programs for the new Seattle Parks District, the grant will provide support for arts festivals and events and temporary art installations in parks across the city. These events and installations will activate and encourage the vibrant cultural work being done in and by communities throughout Seattle. Highlights include the Othello Park International Music and Arts Festival, a showcase of southeast Seattle’s rich cultural heritage featuring authentic music, dance and food from East Africa, the South Pacific Islands, the Filipinas, Latin America, and more (August); Jimi in the Park, celebrating the re-opening of Jimi Hendrix Park and the opening of the Northwest African American Museum’s exhibition Jimi in the Park (September); The Art & Culture of Lucha Libre, a celebration of one of the most popular sports in Mexico—wrestling with high-flying, acrobatic moves in South Park (July); and the Luminata Lantern Walk at Green Lake, an annual autumnal celebration that boasts an illuminated, hand-built lantern parade. (September). Approved by voters in 2014, the Seattle Park District provides more than $47 million a year in long-term funding for Seattle Parks and Recreation including maintenance of parklands and facilities, operation of community centers and recreation programs, and development of new neighborhood parks on previously acquired sites. 2016 is the first full year of implementation and will include funding to tackle the $267-million major maintenance backlog; and will fund the improvement and rehabilitation of community centers; preservation of the urban forest; major maintenance at the Aquarium and Zoo; day-to-day maintenance of parks and facilities; more recreation opportunities for people from underserved communities, programs and art activations for young people, people with disabilities, and older adults; development of new parks; and acquisition of new park land. For more information, please visit http://www.seattle.gov/parks/projects/ParkDistrict/default.htm.